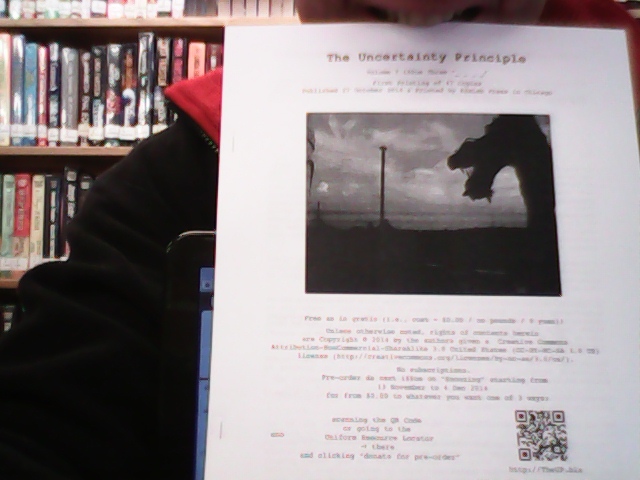 I am proud to announce that the October i$$ue of The Uncertainty Principle was printed and published in Chicago on Monday! Volume ? i$$ue three “_ _ _ _” was distributed to select stores and mailed to select individuals this week. If you want a copy, please e-mail editor@theuncertaintyprinciple.biz. Also this week The U.P. website was updated and (as you can see) the WordPress plugin issue that had been bugging out this blog was corrected! Stay tuned for more new publications, posts, educational resources and more in the coming months!! In the short term, look out for the web version of this i$$ue to be published on November 13th, 2014. This entry was posted in The U.P. and tagged open education, The U.P., The Uncertainty Principle, _ _ _ _. Bookmark the permalink.